2010 is coming up and I was surfing the internet for next year triathlon / running / cycling activities – international / overseas participations especially races that I have not heard of. The only place in Brunei which resemble this is Sg Liang-Labi Hills. It has a long climb and a good fast descends. The run is 10km running through hills, beach and a sprint to the finish line. This will be our next target for next year 2010. It is not your normal kind of triathlon. TT/Triathlon bike will not be any help here – it will be useless. A road bike with a good cassettes such as 12-25 or even better 12-27 and if you’re not so sure, change the crank also to a compact crank. 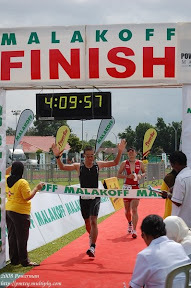 It is considered one of the toughest triathlon in ASIA and a very scenic routes. The only triathlon which has the same terrain is Lake Kenyir Triathlon in Malaysia but still it is nothing compared to Lombok triathlon. Other triathlon / long distance triathlon which has mountainous/hilly bike ride are somewhere in Europe such as Alps de Huez Long Distance Triathlon. Lombok is one of the Indonesian Island with Mataram as its Capital city. It is located east of Bali. Getting to Lombok can be either by Sea or Airplane. For us we can fly from Brunei to Singapore, Jakarta or Surabaya and then take the next flight to Lombok. Be prepared for next year Lombok Triathlon…………………….